**Check Out Our New Premium Pool Cleaning Package! – Not only does it include our normal service; brushing, vacuuming, checking chemicals etc, but it also includes the use of our Salt System! 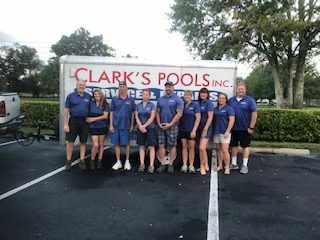 Clark’s Pools, Inc. has been your go-to source for pool maintenance repairs in Spring Hill, FL since 1996, pool cleaning and repairs since 1998, and we’re committed to providing our customers with the best pool services available. Summer is the peak time to seek out effective pool maintenance and repair in Spring Hill, FL, and Clark’s Pools, Inc. is your number one source for service in the area. We’ve been tending to pools in Spring Hill, FL for more than 20 years, and we know all of the ins and outs of swimming pool care. No matter if you need an acid wash, weekly cleaning or a pump repair, we’re the place to call. Best of all, you won’t find a locally owned business specializing in pool and spa maintenance in Spring Hill, FL that is more dedicated to providing the highest level of customer care. We’re here to take the workload off of your shoulders so that you can start enjoying your pool right away! We offer a huge range of products and services to accommodate any pool. We have been servicing pools in the area for more than 20 years. We can provide cleanings, repairs and installations—anything your pool may need. We service all types of swimming pools all year round. Is your pool damaged or dirty? Call on Clark’s Pools, Inc. to get it back into proper working order right away!